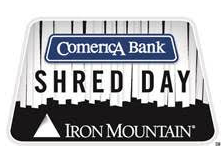 Comerica Bank, Iron Mountain and Re-Source Partners invite the community to the annual Shred Day event Saturday, May 6, from 8 a.m. to 1 p.m., at Comerica Park. Shred Day is a free document shredding event designed to help raise awareness for identity theft protection. Sensitive documents containing addresses, social security numbers, financial information, etc. that are no longer needed should be destroyed and kept out of the hands of thieves. Iron Mountain will shred paper documents onsite using mobile shredding units or live shredding trucks. The shredded paper will then be turned into pulp and recycled. Re-Source Partners will be collecting electronics such as computer systems and accessories, handheld devices and office equipment for recycling. 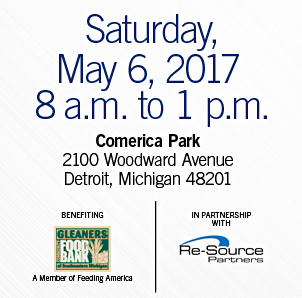 In 2016, Comerica Bank collected 829,094 pounds of paper at Shred Day events held across the country– enough to cover the Comerica Park infield almost 3,000 sheets of paper deep or enough to cover the entire Comerica Park playing field more than 500 times. Gleaners Community Food Bank will be collecting nonperishable food items during the event as well. Everyone is encouraged to give back while protecting their identity.